Supports all file formats for portable devices & PCs. Never deal with copy protection problems again. Legally remove DRM copy protection from music, audio books and videos. The conversion maestro with support for customizable output profiles. Universal converter with support for over 50 audio and video formats. Up to 27x speed recording process (High-Speed Digital Dubbing) and recording of up to 9 music tracks simultaneously. Audials is super fast at recording Spotify audio books. Listen to all your Audible audio books converted to MP3 or AAC wherever you go. Enjoy the best entertainment with the Audials player for music and audio books: equalizer, playlist generator, mini player – everything is included. Music video playlists offer a wide variety of music with great audio quality. 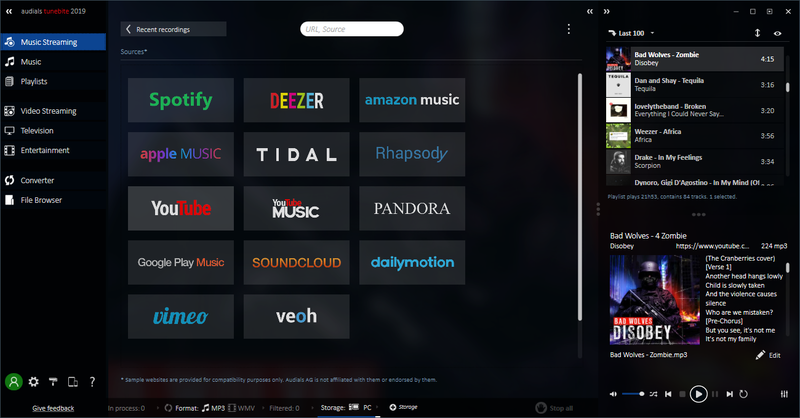 With the new "Video portals" tile, it is now easier than ever before to automatically save all the music videos you play on music video portals, even including complete playlists. Audials then automatically saves the soundtrack from the videos in the highest quality and saves the music (e.g. as an MP3) with all of the ID3 tags, album art and lyrics as usual! Music tracks from your music streaming services, e.g. Spotify™ or Deezer™, are recognized as music, recorded from the stream and automatically saved with tags. 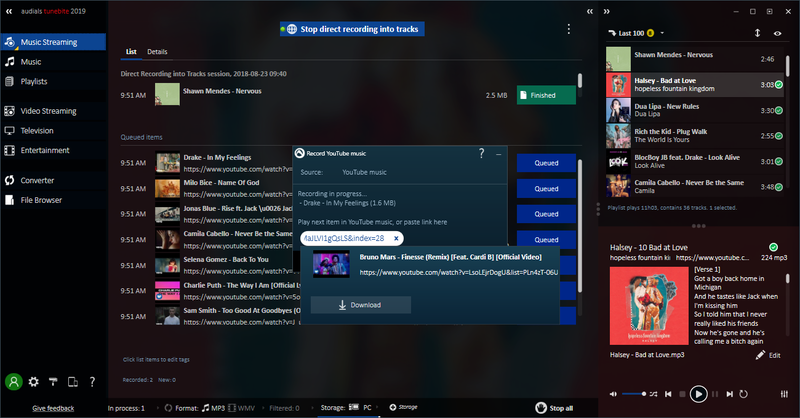 Whenever you listen to a song on a website or in the player of a streaming program, Audials Tunebite Premium can record it for you and automatically save it, for example, as an MP3 file. 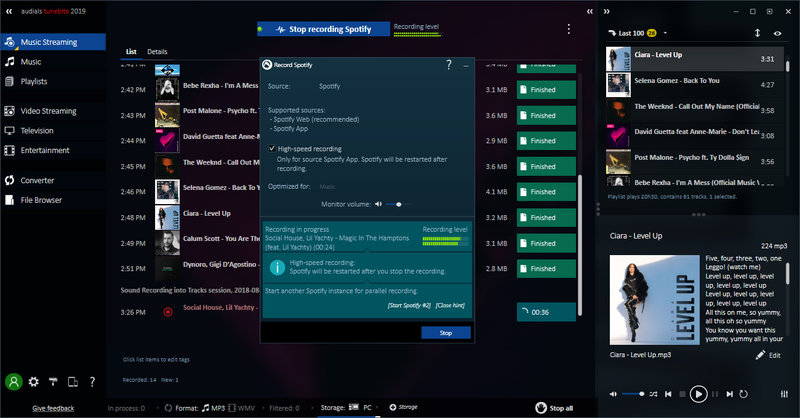 Audials can play Spotify music streams and record them without any loss of quality! 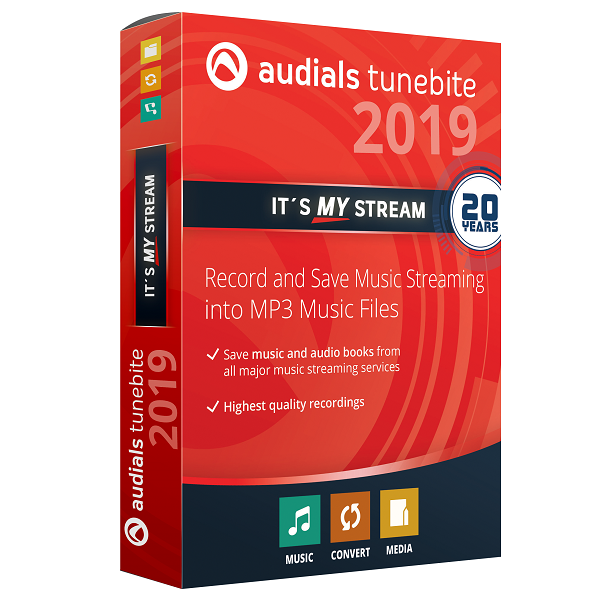 Containing no commercials and with perfect volume adjustment, Audials Tunebite automatically records the music stream and saves it in top quality and with all ID3 tags to your hard disk, directly to the cloud or on your smartphone in any of the main audio file formats. In addition to music streaming, Spotify and Deezer now also stream audio books. Audials is well prepared to record audio book streaming, too. Keeping Up with Platforms: Mission Accomplished! Ensuring that you are always able to record all streams from all providers with their different formats and standards is both a responsibility and challenge for us. Very few software tools have the capacity to record so many different types of streams on an ongoing basis. At no extra charge, we ensure that during the operating life of each generation of Audials, software is upgraded completely automatically and almost immediately upon any changes to video services and portals to ensure the software remains fully functional. Audials Tunebite has a unique innovation so that the quality of your music and audiobooks doesn´t suffer. With PerfectAudio we give you our promise of quality with a well-developed process that only allows for top results. During recording-based conversions, for example, Audials Tunebite records the audio file multiple times and compares it with the original until the result is perfect. Audiobooks Lasting Hours Converted in Minutes for All Devices! With Audials Tunebite, you can convert audiobooks with or without chapters for all devices. To do this, Audials Tunebite uses audio book libraries, such as Apple iTunes, as a virtual CD drive. Using virtual burning, Audials then saves audiobooks as MP3 files in top quality. Audials automatically enriches your music collection with complete ID3 tags, cover images and song lyrics at the early stage of the recording process. Imported music tracks can also be brought up to the standard of your music collection thanks to the automatic addition of any missing tags by Audials Tunebite. This is done with both small numbers of imported tracks and large multi-gigabyte music collections. You can have playlists shown in a text view or a graphical view with album covers according to seven sorting and grouping criteria. You can export playlists in standard formats and then use them in other players independently of Audials. Similarly, you can also import playlists from other players, e.g. Winamp, and use them in Audials. Access the music, videos and films on all your computers when you're on the move with your Android smartphone. Simply leave your PC running and with Audials Anywhere you can access, browse, play and download your media at any time and in any location.